It might seem counter intuitive to close shelters given the massive tornado last May that destroyed entire neighborhoods and killed 25 people right next to Norman in Moore, but there is logic to it. According to the Norman fire chief, the shelters only give residents a false sense of security and that it’s much better to “shelter in place,” not risking traveling during severe weather. In other words, the odds are people are just as safe in their homes, with or without a storm shelter. I’m not going to try to dispute that logic. It’s pretty much an accepted concept around this area. I do think the idea of eliminating public shelters would seem odd to many people who live outside the state. But the council’s decision should open more conversation on the role, if any, of government to protect its citizens from severe weather. For example, why doesn’t Norman, or any local city, simply build sturdy, underground shelters for its residents that WILL protect them from tornadoes? Is it a matter of cost? Why doesn’t Norman, or any local city, require new homes to include storm shelters? Why don’t local cities launch better incentive programs so residents can get a storm shelter in their home? Why don’t cities require storm shelters in apartment complexes? I’m not picking on Norman, but the official answer to all these questions in this area has always seemed to be: it’s not our problem. You’re on your own. This is what baffles many people from outside our state after a major tornado strikes here and the federal government comes to our rescue. They wonder why there aren’t more shelters here, in homes, schools, everywhere. 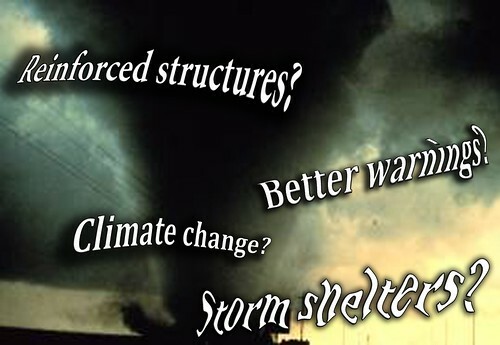 Why don’t Oklahomans prepare better for tornadoes? Oklahoma has had many image problems on the national level for a long, long time. I think the lack of ongoing comprehensive tornado safety initiatives is one of those problems. This particular image issue always emerges when the state dominates worldwide news headlines after a massive tornado strikes. As I wrote earlier, one effort to raise the safety level here by helping schools build storms shelters is even getting shot down by the governor and one of the state’s largest newspapers. The decision by the Norman City Council does make sense in its particular way, for sure, but it really doesn’t address the larger issue of making Oklahoma a safer place to live.